There seems to be a bit of controversy in regard to the performance of cables and components improving as they break-in. Some people claim to hear significant improvements in their gear over time, while others say they hear only subtle improvements, if any at all. But seriously, in my experience, break-in time makes significant differences in performance in any cable or component. In some products, especially those that have been hardened with cryogenic treatment, longer break-in time can make a huge difference. In this blog I’ll explain how this break-in phenomenon works and I’ll offer you a few tricks to make the process as fast and easy as possible. Please keep in mind that this blog attempts to convey technical concepts in layman’s terms, and every reader might not agree with our geek-to-English translations. If you want clarification on any of the points made in this blog or more information about any of the topics covered, please feel free to contact me directly. What’s the best way to break in cables and components? You have two break-in options: in-system and out-of-system. No matter what materials are used in the conductors and insulators, to fully break-in cables and components it will take hundreds of hours.There is also no way you can fully accomplish break-in while out-of-system. Let’s review some of the more popular break-in methods and compare their advantages and disadvantages. To start with I would like to dispel a common misconception: there is very little you can do to accelerate the break-in process. Electrons only move so fast through a specific material of a specific size at a specific current. As you increase the current you will accelerate the break-in process a bit, but this is only applicable to the earlier and coarser stages of break-in. The only way to fully break in a cable or component for use in a specific system is to play the actual music you listen to, at your maximum listening volume, in your actual system. This is because each cable and component exhibits different patterns of frequency and current when used in combination with other cables and components, when played at different volumes, or when played with different intensities of music. You can accelerate in-system break-in a bit by playing at higher volumes, or putting a power cable on a higher current draw component such as an amplifier or power distribution center, but this too is only applicable during the earlier and coarser stages of the break-in process. There’s no question that out-of-system break-in methods can save significant hours of in-system break-in time. And the more closely these out-of-system break-in methods simulate the actual frequency and current patterns that exist in your system, the more efficient and effective they are. A cable cooker is a component that combines dummy loads and frequency generators. You can buy a cooker as a complete unit or make one yourself. The big advantage of cookers is that they’re self-contained, and the greatest disadvantage is that they use broad-spectrum frequency generators as opposed to actual musical signals, so they can only be used for a small portion of the full break-in process. A cable cooker will roughly save you the first 100 hours of break-in, which leaves you to do the majority of the break-in with another out-of-system method or in your system. Another disadvantage is that cable cookers can be pricey. There are other break-in methods that are more versatile and can be more cost effective. A dummy load is a device used to simulate an electrical load, usually for testing purposes. Several types of commercially manufactured dummy loads are engineered for specific purposes, such as testing and adjusting amplifiers, but no commercially available dummy loads can be used to break in all types of cables and components. If you can’t buy one, you’ll have to make one. And later in this blog, I’ll describe how to make several different types of DIY dummy loads. Hooking up a non-audio appliance to a power cable that you want to break in can save you several hours of in-system break-in time, but just like with cable cookers, this will only begin the break-in process. Appliances such as computers and refrigerators shouldn’t be used to break in power cables because they have energy-saving modes. High-current appliances, such as portable electric heaters or window air conditioners, work quite well, however, and I only recommend using one of these high-current appliances for the first 100 hours of break-in. To do this, you need an IEC to female 3-prong adapter (see photo below) to attach the power cable to the appliance. You can even use more than one of these adapters and “daisy chain” multiple power cables together to break in more than one at a time. Warning! Some power cables, some AC plugs, and some adapters have lower current capacities than many appliances. Check periodically to see if you’re overloading power cables and adapters by touching both the wire and plug areas to detect if there’s any heat. If you feel heat, don’t continue using the power cable or adapter unless you can decrease the appliance’s current draw by turning it down. Then continue to check for heat. In addition to daisy chaining power cables to break in more than one at a time, you can break-in multiple sets of interconnects with an adapter like the one shown below. 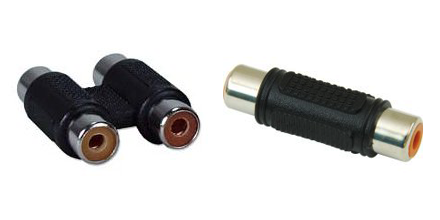 You can buy either male or female “cable extenders” for both RCA- and XLR-style connectors. Frequency generators and break-in discs use broad-spectrum patterns that are reputed to efficiently break in cables and components, but they’re not an ideal substitute. Using them is equivalent to exercising in a gym to build up your body for a specific athletic activity. Just as gym training is considered a supplement to rather than a substitute for a specific athletic activity, broad-spectrum break-in can be used to begin the break-in process, but a significant amount of in-system break-in is still required. A second audio system is one of the best tools to use for out-of-system break-in. You can buy high-quality, modestly priced used audio components for less than the price of many cable cookers and frequency generators. The big advantage of having a second system just for break-in is that all audio systems have similar frequency and current patterns, so most systems will do more than other methods to break in your cables and components. Many of my customers who own expensive phono cartridges or expensive tubes prefer to use a second audio system or home theater system for the majority of the break-in process. This is a very wise choice, as it saves the life of their expensive components. Remember that playing music through a source component and interconnect without selecting them on the preamplifier won’t “load” the cable and component and doesn’t allow break-in to occur. If a cable or component is “unloaded,” the circuit is open and there’s no path of continuity for the electrons to flow. How long does it take to break in cables and components? During the first 25 hours of break-in, it’s quite common to have significant improvements in performance. This is why many manufacturers “cook” their products for a short time to make them sound more impressive right out of the package. The materials used in a product, and the treatments these products went through in manufacturing, will determine how much of a performance improvement will occur during a specific period of time with a specific break-in method. 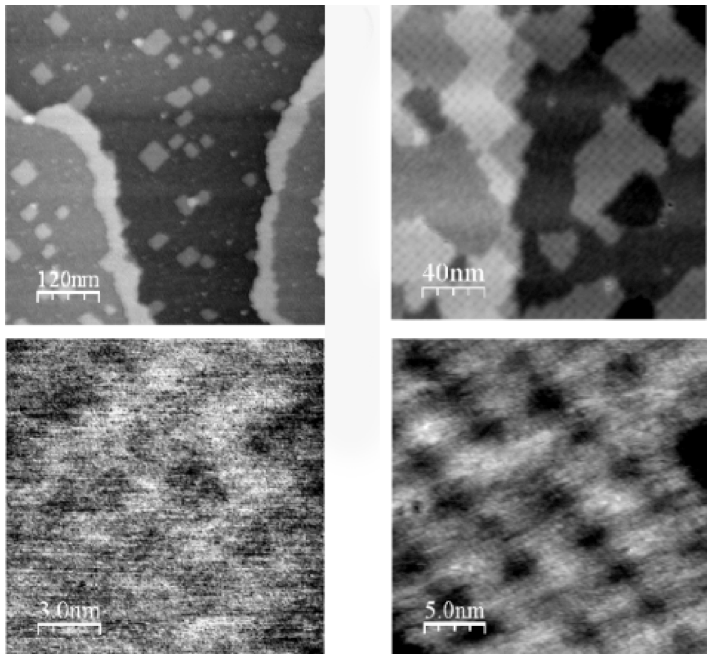 Some processes, such as cryogenic treatment, will harden conductors significantly, which increases the amount of break-in time required, and other processes, such as annealing, will soften conductors significantly and reduce the necessary break-in time. Just like with conductors, the polymers used in insulators can have vastly different molecular densities and properties. Higher density insulators, such as Teflon, take significantly longer to break-in than a lower density insulator, such as cotton. Obviously, results will differ from product to product, but in general, during the first 100 hours of break-in, whether it’s done in or out of the system, most of the odd, unbalanced, veiled, and fatiguing sounds disappear. After 100 hours, most cables and components stabilize in character and exhibit more detail, dynamics, and extension with additional break-in time. In general, audible improvement during break-in decreases with each hour, and similar improvement becomes audible roughly as the break-in time is tripled. For example, you’d likely notice a similar amount of audible improvement during the first 25 hours, at about 100 hours, at about 400 hours, and then at about 1,300 hours of break-in. A tip for DIYers: Even so-called interchangeable parts inside components sound vastly different after break-in. During R&D, I build multiple boards with identical component parts except for one, and then I break in the boards 24/7 for weeks before making comparisons. Once I’m left with only a few parts to compare, I break in the boards for another 1,000 hours before making my final selection. Often I’ve been quite surprised by how audible the differences are between supposedly interchangeable component parts after they’ve been broken in for that long. A dummy load can be made by combining a mating connector with a resistor that’s similar in value to the input impedance of the component it’s meant to simulate. One of the advantages of using dummy loads to break in cables and components is that you can run equipment silently 24/7 rather than annoy the people you live with or your neighbors. In addition to matching the dummy load resistor value in ohms to the input impedance of the next component in the audio chain, it’s important to use a resistor that has a high enough wattage rating for each place in the signal path. In the “how to” section of this blog there is a downloadable PDF with some of the more common resistor values and wattage ratings you’ll need for specific components. For amplifiers and speakers, the impedance can vary from below 4 ohms to above 16 ohms and often requires a resistor with a very high wattage rating. High-wattage 8 ohm dummy loads are used by techs to bench test and adjust amplifiers. These high-wattage dummy loads are usually made from wire-wound resistors in heat sink-style aluminum casings. If you own a low-wattage amplifier, you can save quite a bit of money by buying a similar type of resistor with a 25 to 50 watt power rating. Warning! Don’t use a resistor for extended periods of time at more than half of its maximum rating and make certain to properly heat sink any type of resistor for the wattage you require. Below is a photo of the 8 ohm 250 watt dummy loads I use on my testing bench. Note the screw terminals on each end of these high-wattage dummy loads. Similar high-wattage resistors that use solder lugs instead of screw-type terminals are also available. You can connect spade-style connectors directly to these screw terminals, but since they’re made from threaded hard metal, it’s quite easy to scratch the finish on your high-priced spade connectors. So if you’re using screw-style terminals on high-current dummy loads, I recommend running a short piece of inexpensive speaker wire to a crimp-on eyelet at the dummy load end. For all types of dummy loads that are intended to be used with amplifiers and speaker cables, I recommend a 5-way binding post plus banana plug on the other end. See below. 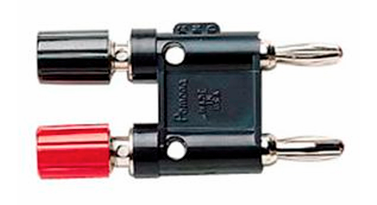 This type of 5-way binding post plus banana plug can be connected directly to an amplifier on the banana plug side or connected to speaker cables with bare wire, banana plugs, eyelets, pins, or spade connectors on the 5-way binding post side. 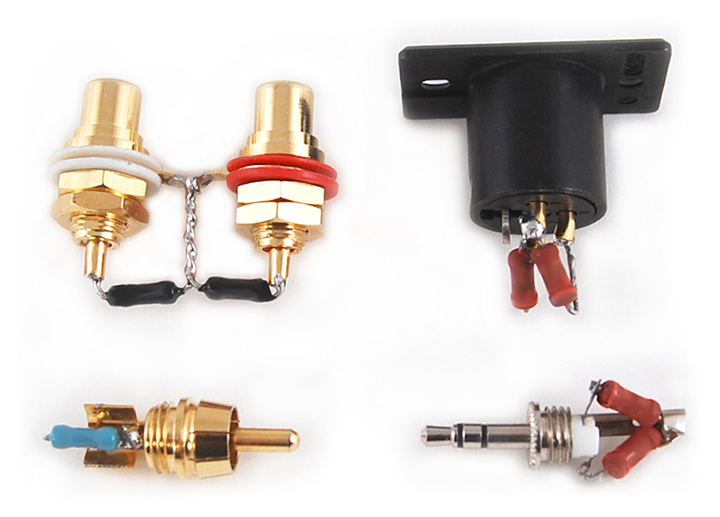 These versatile connectors can really save you time if you have a variety of different products you want to test or break-in. For line-level cables and components, such as source components, pre amplifiers, crossovers, and interconnects, dummy loads with a ½ watt resistor may be enough, but I recommend using a higher wattage, such as a 1 to 2 watt resistor, for safety and durability. The ideal value to use as a dummy load on line-level components is a topic of some debate. Pro audio components are standardized at a 600 ohm input impedance, but there’s often quite a variation in the input impedance of modern home audio components, and many have an input impedance that’s well over 10K ohms. The more closely you match your dummy load resistor’s value to the actual input impedance of the component you’re trying to simulate, the shorter and more complete your break-in period will be. This is because a closer match creates more similar frequency and current patterns. You can get the input impedance for most components from their spec sheets or owner’s manuals. 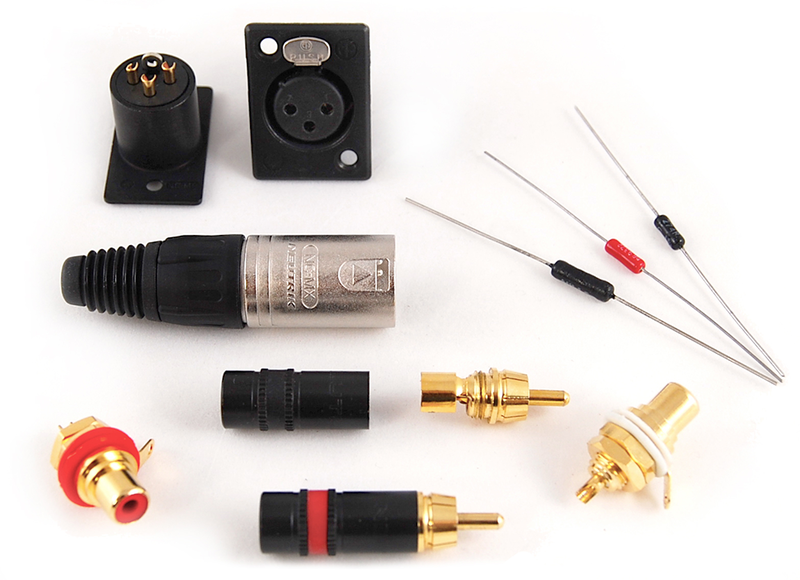 Of course, many people prefer the convenience of simply using 600 ohm dummy loads with pro audio gear and 10K ohm dummy loads with home audio gear. Digital cables work in much the same way as analog signal cables and have a standard for loading. 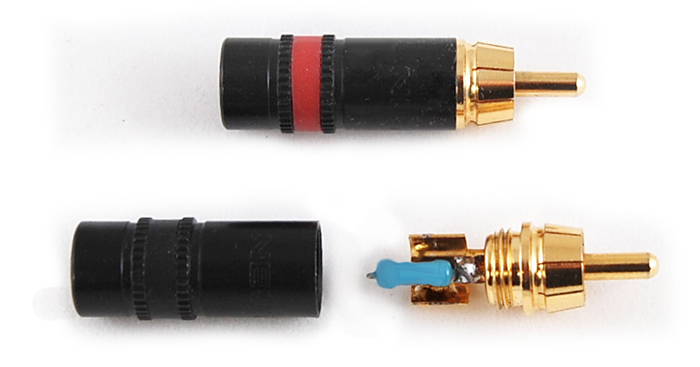 For unbalanced digital cables with an RCA or BNC connector, a 75 ohm load is standard; for balanced digital cables with XLR connectors, a 110 ohm load is standard. To make a line-level or digital dummy load, all you need to do is solder the proper value resistor between the terminals of the connector that mates with the cable or component you want to break in. In most cable-style connectors, there’s enough space inside the case to insulate and protect the resistor. If you’re using chassis-style connectors, you can mount them in a small project box or cover the exposed contacts with shrink tubing. 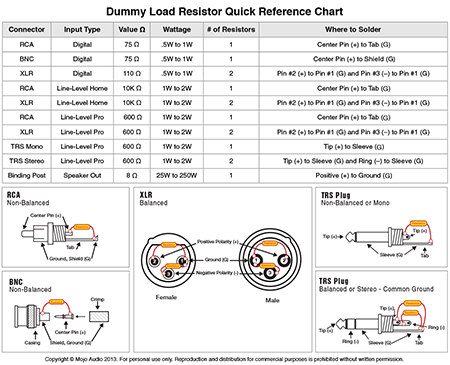 Below is a PDF dummy load quick reference chart you can download that outlines several types of connectors, used with several types of analog and digital components, along with number of resistors needed, resistor values, resistor wattages, and tips for assembly. 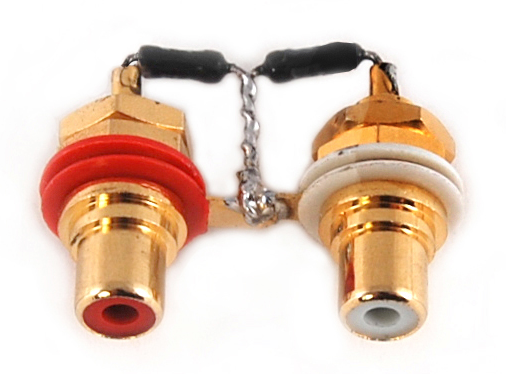 It can be convenient to connect two dummy load connectors together for use with stereo interconnects. RCA jacks can easily be connected by their grounding lugs, whereas XLR jacks require a custom bracket of some kind to hold them together. Dummy loads made with cable-style connectors are used to break in components. Because the resistors are inside the connector’s case, these dummy loads are clean looking, safe, and trouble-free. Another option that works well for professionals is to put chassis-mount connectors in a project box or mounting strip on their bench or break-in rack, which allows them to quickly plug in and out different components. Once you understand the concept, you can make a dummy load for any style plug and for any type of cable or component. All you need is the wiring diagram for the connector and the input impedance of the component you’re trying to simulate. How do audio cables and components break in? Below is the ultra-geeky part of this blog that explains how current flows, how electrons move, and how cables and components break in. Though you may find this background interesting, there are no “how to” instructions in it. If you’re not interested in theory, you may want to skip this section. Okay. Get ready for some pretty serious geek-to-English translations. When energy is applied to and removed from a material, it changes the material on a molecular level. In order to disperse the energy, molecules realign in different patterns that change and reset the properties of the material until such a time as sufficient energy is reapplied once more. Mechanical, electrical, and thermal energy can all realign the molecular structure of materials when applied in sufficient quantities over sufficient periods of time. We’ve all experienced mechanical break-in on products like shoes. The more we wear a pair of shoes, the more flexible they get, and the more they conform to the shape of our feet. Some shoes are made of harder materials and take longer to break in. If you’re a bowler or a fashionista, you may have worn another person’s shoes and found that though they were completely broken in and the correct size, they didn’t fit quite as comfortably as your own shoes. This experience may help you understand why you need to break in cables and components in your system to achieve the more subtle stages of break-in. In the manufacture of metals, processes such as tempering, annealing, anodizing, and cryogenic treatment are used to change the properties of the metals to make them more suitable for specific purposes. These processes require intense amounts of energy to be applied over short periods of time. Break-in takes place when lower levels of energy are applied over longer periods of time, causing more subtle molecular realignment. Since break-in occurs on a molecular level, you need to first understand how current flows and electrons move before you can understand how break-in takes place in cables and components. In any type of conductor, disassociated electrons float in a “sea” that permeates the outer layer of the atoms that make up the 3D lattice of molecules that make up that conductor. Below is a graphical representation of a generic molecular lattice. Note that the “sea” of electrons moves in the spaces between the spheres that represent atoms and the rods that connect the spheres that represent atomic bonds. Current creates “holes” by removing electrons in the outer layer of atoms in the molecules of conductors, causing electrons to move from the outer layer of one molecule to another in order to fill these "holes" and neutralize the negative charge. Current can be described as an electron flux that moves electrons in the opposite direction. You read that correctly: electrons move from the negative pole to the positive pole, which is counterintuitive to what would appear to be true. When 1A of current moves in one direction, 6.24 x 1018 electrons flow in the other direction. Historical note: Apparently Benjamin Franklin was the guy who incorrectly assigned the + and − sign convention we all use because he erroneously thought a movement of positive current existed. What can I say? Nobody can be right all the time. One of the best ways I’ve found to explain how current flows is to use the analogy of rivers and oceans. Direct current (DC) flows in one direction, similar to a river, and alternating current (AC) flows back and fourth, similar to the waves in an ocean. DC current flows through the power conductors in electronic components, and AC current flows through the signal conductors and AC mains power. Now that you understand how current flows and electrons move, I’ll explain how this all relates to break-in. Within every conductor there are impurities, molecular grain, and/or crystalline structures. All of these inconsistencies in the conductor create gaps in the molecular lattice, and electrons see these gaps as obstacles they have to flow around. Below are some highly magnified photos of molecular structures that show inconsistencies. Electrons always seek the path of least resistance. Break-in occurs as electrons slowly reorient the gaps in the molecular lattice, creating a path of lower resistance in much the same way that water reshapes a riverbed. At first the current forces the narrow gaps in the molecular lattice to close; this is analogous to a river sweeping away loose silt. As more electrical current is applied over time, the wider gaps in the molecular lattice close; this is analogous to a river moving dirt and small pebbles. In the later and more subtle stages of break-in, the widest gaps in the molecular lattice close; this is analogous to a river eroding away solid rock. It’s also important to note that electrons flow through conductors in patterns of higher frequencies and lower frequencies as well as higher current and lower current. These frequency and current patterns correspond with the musical signal. Since higher frequencies travel closer to the surface of a conductor, and higher current travels closer to the core of a conductor, the path of least resistance subtly changes when different current and frequency patterns are applied. This is why additional break-in time is necessary when cables and components that are 100% broken in are used in combination with other cables and components. Like conductors, semiconductors and insulators have a similar break-in process. Part of why break-in takes place on insulators as well as conductors is because insulators can hold an electrical charge. This charge is similar to the static electric charge we’ve all observed in clothing, carpeting, and hair. When electrical charges exist in the insulators of conductors, an undesirable dielectric effect is created that causes distortion of the frequency and current patterns. I could go into great detail about all the different effects semiconductors and insulators have on break-in, but it should suffice to say that as break-in occurs, the molecular orientation of these materials creates a path of lower resistance and lower absorption. As bending or coiling of cables occurs and as tilting and vibration of components occur, the molecular orientation is changed, creating more resistance and higher absorption. Another common consideration during the break-in of many audio cables and components is cryogenic treatment. 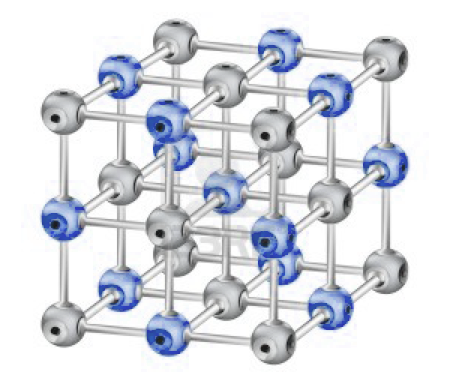 When materials are cryogenically treated (or cryo’d), the molecules in the lattice are compressed because they contract from the intense cold. This compression rearranges the molecules in a more symmetrical orientation and creates a higher molecular density near the surface. This more symmetrical molecular orientation combined with a denser molecular surface structure results in lower resistance and lower noise in cryo’d conductors. Because it takes the current more time and energy to reorient a higher-density molecular lattice, cryo’d conductors take significantly longer to break in. In my experience, it takes over 300 hours of break-in before most cryo’d cables and connectors reveal close to their full potential. Is break-in permanent or can it be reversed? The level of performance achieved with any amount of break-in is never permanent. When components are vibrated or tilted, or when cables are coiled, bent, and unbent, the lattice structure of the molecules is reoriented. When this happens, some performance is lost. After cables or components are moved it often takes 24 to 72 hours of additional break-in to return them to their former level of performance. A similar type of molecular reorientation takes place in semiconductors and insulators. For this reason, many of the same characteristics of break-in that can be observed in cables can also be observed in electronic components. Many capacitors are quite sensitive to vibration and movement because they’re filled with powders and oils that can shift and change the path of least resistance. If components have oil-impregnated capacitors, vibration and movement are more likely to negatively affect performance. One reason why anti-resonant decoupling devices improve the performance of components is because they minimize the vibrational reorientation of powder- and oil-filled capacitors. Most cables and components don’t sound good for the first 25 hours of break-in, and most sound quite good after 100 hours - after 100 hours improvements are always more subtle. Most out-of-system break-in methods are only effective for the first 100 hours of break-in. Because cryogenically treated products have increased molecular density and hardness, they must break in for over 300 hours before they reveal anything close to their full potential. Certain polymers used as insulators, such as Teflon, take longer to break-in than other insulators due to their higher molecular density. There are several out-of-system break-in devices, including cookers, frequency generators, appliances, and second audio systems. Different out-of-system break-in methods are more effective and efficient, but no out-of-system break-in method can fully break in any cable or component. Warning! When using high-current appliances for the initial break-in of power cables, check adapters, wires, and connectors for heat to make sure the adapters or power cables aren’t overloaded. Using a second audio system in combination with dummy loads to break in cables and components will yield the highest percentage of out-of-system break-in and can be done silently 24/7. When cables are bent, it often takes 24 to 72 hours of additional break-in before they regain their former level of performance. Minimizing bending and coiling when relocating cables will preserve their performance. When components are moved, it often takes 24 to 72 hours of additional break-in before they regain their former level of performance. Minimizing vibration and tilting when relocating components will preserve their performance. One of the reasons Mojo Audio offers a 45-day no-risk audition on all of our products is that we realize cables and components require weeks of break-in time before they can show anything close to their full potential. Many customer who have purchased our cables and components have commented that they were initially impressed with how great they sounded after the first few weeks of break-in, but they couldn’t believe how much more they improved over the next few months. If you like what you read in this blog and are interested in getting more free tips and tricks, sign up for Mojo Audio’s Audiofiles blog. Also, sign up for our e-newsletter to get more useful info as well as coupons, special offers, and first looks at new products. Plus, don’t forget to “like us” on Facebook.